It's been a while since my last post. Unfortunately, there was not too much to report work-wise over the weeks in between, up until a couple of days before Clara and I made our third field visit to Bihar (though on the personal side, I had a joyful reunion with my wife, Kasia, who flew out here for a week - I'll post some pics from our visit to beautiful Bekal, Kerala, later!). This field visit was a very important one: as we had built a questionnaire to interview both qualified (doctors) and unqualified rural medical practitioners (RMPs, or "quacks") over the past month, we were finally able to put it into action, first training four interviewers on how to administer the questionnaire, and then accompanying them in the field to give them first-hand experience in taking the interviewees through the survey. For this study, we are focusing on four of the eight districts (analogous to counties in the US) in which CARE is currently operating their anti-Kala Azar program, and we selected the four with the highest number of KA cases this past year. In the weeks preceding the visit, we had a ton of help from Dr. Indranath, who is serving as our project head, as well as Indrajit, Ishani and Rahul from the CARE Patna office who aided us in finalizing the questionnaire, pressure testing some of the questions, giving advice on the format and structure to enable analysis of the data when the study is complete, hiring the interviewers, translating the survey, selecting two blocks within each of the our districts (blocks are similar to townships in the US) and arranging our field visit by coordinating travel with the Samastipur district office. Ishani has been with us for each of our field visits, serving as our interpreter, and Rahul is now our point man for the project in general. So grateful for all of their help!! We arrived in Patna on Tuesday afternoon and we happy to get our old rooms back in the CARE Guest House (which is excellent!). 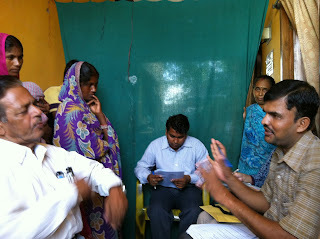 Wednesday morning, we headed to the CARE office to meet with the team and the interviewers. 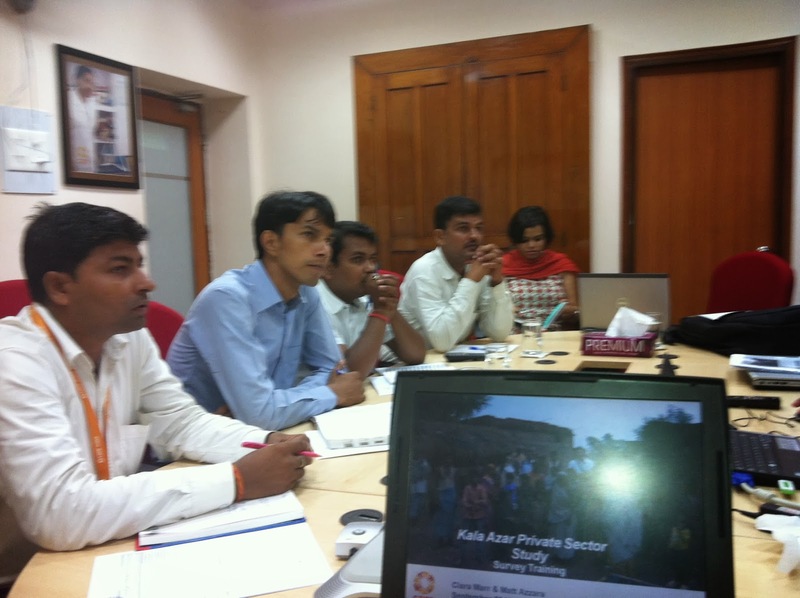 Dr. Indranath provided an overview of Kala Azar - what the disease is, how it is spread, and whom it affects. Then Clara and I tag-teamed on presenting an overview of the survey: the goals - namely, to better understand the role these private medical practitioners play in diagnosing and treating KA, to enable the development of a strategy to engage these people in the efforts to eliminate the disease, and to prepare for a much larger study next year - plus the methodology and a walk-through of the questions. We made it clear that the interviewers were not to mention Kala Azar before or during the interview, at least until either the practitioner himself mentioned it, or until they finally reached the Kala Azar-specific questions, more than halfway through the survey. The reason for this is that we were really attempting to understand the thought process of these practitioners when the receive a new patient, especially a patient with a fever, and to determine at what point he (and 100% of the providers we have seen are male - there are virtually no female practitioners in rural India!) starts thinking about KA as a diagnosis. After hours of discussion that took us through each question (and enabled us to tighten up a couple of them), we adjourned to prepare for the field visit the next day. The drive to Samastipur was fairly pleasant, despite some traffic leaving Patna. It took about three hours - some nice, smooth stretches of road punctuated by the occasional ruinous mess of broken asphalt, deep gouges, and rutted gravel-and-dust you find all over Bihar. Samastipur district is the closest to Patna out of the four districts in which we'll be conducting the survey, hence our choice to do our field testing here. We first stopped by one doctor's clinic which was an Ayurvedic hospital, but he was a bit taken aback by the size of our group, I guess. The doctor was was pleasant enough but asked us to come back after hours (about 8PM) for the interview, as he had a lot of patients waiting. Before heading to the next appointments, we split up to tackle more interviews (and thus give the interviewers more hands-on training), but also to make each group a more manageable size. I went with Rahul, Dr. Indranath, Ajeet and Deepak. We headed for a large private clinic (it felt like a small hospital), where we found a big crowd waiting to be seen by the doctors. We were escorted by one of the clinic staff to see the doctor...who happened to be administering an ultrasound to a pregnant patient! One of the things I've had to get used to is the lack of privacy in medical facilities here. The woman was fully dressed, but I certainly felt like I was intruding on what should have been a special (and private) moment for her and her family. The doctor wrapped up the ultrasound and sent the patient and her husband on their way, and settled in to talk. Dr. Indranath made the introductions and explained our purpose, in Hindi. The doctor smiled at me and introduced himself in English, and throughout the interview often stopped to give me a bit of a play-by-play. Ajeet administered the survey, and did a nice job (given that it was the first one! ), with only a couple of corrections or clarifying comments by Rahul and Dr. Indranath. Midway through, the doctor had glasses of hot chai brought to everyone, a common practice here when entertaining visitors. The survey took almost an hour, which again made me feel a bit guilty - there were plenty of patients waiting to be seen, after all, but the doctor explained that long waits are expected at the clinic or really any medical facility, and patients arrive prepared to wait. This didn't make me feel much better, but we thanked the doctor and left the clinic. It felt great to have one successful interview under our belts, so we headed over to a second doctor's office to try a second go. As we entered his small clinic - only a few patients waiting this time - I took note that there were posters and gift items from multiple pharmaceutical companies (some multinationals, some Indian - though nothing from Pfizer!). Interesting to see that (apparently) drug reps make visits even to these remote private offices. The doctor greeted us warmly - first in Hindi, and then (for me), in English. His English was quite strong, in fact. He introduced himself and shared with us that education of patients, especially about diabetes, was his passion, and he shared some educational pamphlets he had developed. He had small glass bottles of Coke brought to everyone as we went through the survey - again, Ajeet asked the questions - and the doctor often reverted to English to help me understand his comments. The survey took a little less time, as Ajeet was gaining confidence in administering the survey, which was a very good thing. Our team had been concerned that the survey might take much longer, and of course it can be difficult to get the time and attention of busy doctors and quacks, let alone sustain their interest for a long time when they have patients waiting. After the successful completion of this survey, we met up with the other group, and had lunch (at a place called Bollywood!). We chatted over our experiences for the morning and determined that we would complete a few more interviews in separate teams before heading to the hotel, and then the interviewers could complete a couple in the late evening. 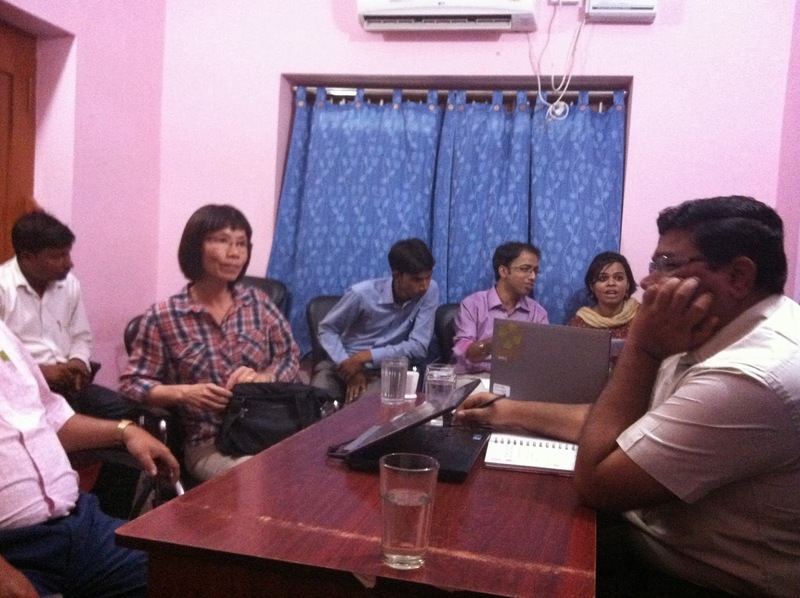 The afternoon went much as the morning - more successful interviews with qualified doctors. All of the doctors we interviewed were quite familiar with KA (after all, these are heavily-endemic districts), knew the causes and treatment options. The final interview I attended was with a doctor who again was quite skilled at English, and despite the fact that Deepak asked his questions in Hindi, he responded in English for my sake (very kind, though honestly I was hoping to observe the interviews the way they would occur in my absence). At one point, when we asked the doctor about his ideal scenario for a KA patient, he commented "we are treating the patient, but not treating society." By this, he meant that the real issue behind Kala Azar is poverty - impoverished communities are struggling to survive, relying heavily upon their livestock (and so keeping them close to their homes), lacking clean water and sanitation, and having little education about how to prevent disease. 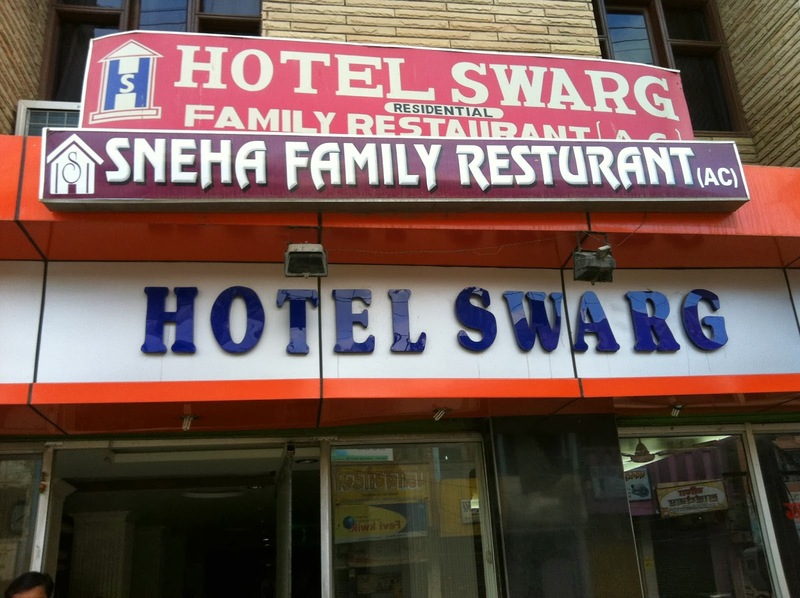 We checked into our hotel in Samastipur that evening. I was pretty tired from an early start date and a full day on the road, and fell asleep without dinner. Overall, we spoke with seven doctors, more than our planned four - a great success. The next day was quack day! We set out to get at least four or five interviews with these unqualified medical practitioners before heading back to Patna. small waiting room and a small room to examine patients; these were adjoining a residence with a a family living in the back. As Vikash interviewed the quack (this time everything was in Hindi), I noticed that we were being watched by a couple of the children who lived in these rooms. 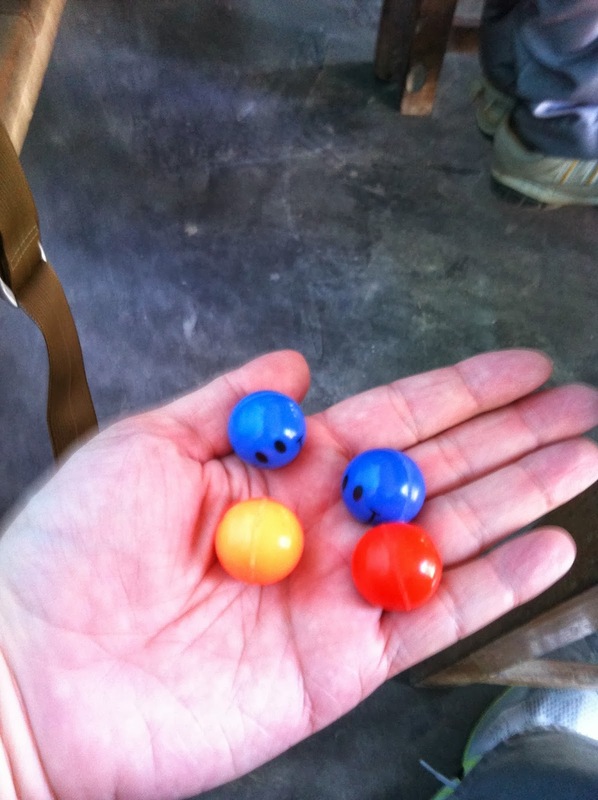 I had brought a couple of bags of "superballs" with me (the small, super-bouncy kind), so I handed a couple to the kids. Their faces lit up, and they disappeared with their prizes. A little later, the kids' parents invited Ishani, Clara, and I to come and see their home. They really just had a couple rooms (a couple of sleeping rooms and a kitchen, arranged along a courtyard where they ate and the kids played), where the father, mother, and their children, plus the father's parents and his teen-aged sister-in-law (who was doing the housework when we arrived) all lived. They didn't seem to have electricity in the room, and their water was drawn from a pump - both pretty typical in the more rural areas as well as in some town outskirts, like this one. 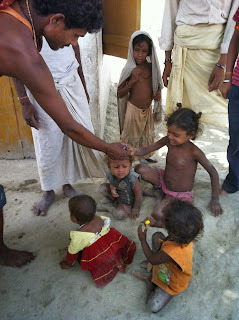 Through Ishani, we conversed with the family, and took some pictures. Their adorable sons shyly came up to me and asked for another superball, so of course I obliged (more than once!). They offered us tea, and brought out chairs for us, so we sat for a while as the boys played. They asked us about our homelands and seemed really happy to have us visit with them. We exchanges mobile numbers, thanked them for their wonderful hospitality, and promised to send them pictures. Meanwhile, MD, the Link Worker, had brought another RMP by, and Deepak had completed an interview with him. We rounded up the troops and moved further down the street, where we went into another quack's office. This man had a few patients in the room, but he sat us down, gave us (more) tea, and Ajeet interviewed him. He said he had been in this location for 46 years - so he certainly had been here through the times (late 1980s-90s) when Kala Azar was a true epidemic, afflicting hundreds of thousands of people in rural Bihar and killing likely thousands. Luckily, indoor spraying, better medicines, and increased public awareness have made a difference since those days. After Ajeet wrapped up the interview (by now down to about 40 minutes), we split into our "teams' again - this time Vikash and Ashotosh accompanied Rahul and I to a more rural location, a small tola further out in Waris Nagar block. This looked more similar to some of the places we'd visited in past field trips, small unpaved roads leading to mixed-material homes (some brick, but lots more wood, mud, and thatch). There were lots of young children around. We walked to the three-walled structure that served as the RMP's office; a young boy who couldn't be more than 10 or 11 brushed the dust off chairs and benches for us, and a couple of the local men sat with us to listen in. Ashotosh conducted the interview with the young, bearded practitioner. As they spoke, a couple of young boys cam by, and I tossed them each a superball. When a couple of other kids saw this, they somewhat-sheepishly came up as well, and I waved them over and handed them a ball each as well. That's when I realized that I had underestimated the number of kids in the tola! A succession of little ones came up in small groups - sometimes chased away by the boy who "worked" there for the RMP. I think I eventually gave out about 40 of them (luckily I had enough). After finishing the interview (and watching the kids racing around, bouncing their superballs high into the air), we drove a bit further to one last RMP office. The office was a standalone structure, painted white outside, pink inside. The 40-ish practitioner was seated behind a small desk. He had a bench that served as a patient bed, where a thin man, clearly ill (though we weren't told his diagnosis), was resting with an IV drip in his arm. Again feeling like an intruder, I sat next to Vikash, who gave the interview; Ashotosh sat next to me on a bench, and we fell into conversation - about KA, life in our respective countries, and other matters. While we chatted, the RMP had asked for glasses of tea and water to be brought in. I mistakenly took a sip of the water (a huge no-no out here), but quickly recognized from the metallic taste that it must be unfiltered well-water. I grabbed the glass of hot tea and downed it quickly (not that it would have helped, most likely, if I had acquired some kind of bug)...but luckily I haven't had any ill effects! After Vikash finished the interview, on the way out of the office, I noticed a few little children, boys and girls, sitting on the ground. I gave them my last few superballs, once again happy to see little smiles beaming back at me. The other "team" joined us there, and then we went to one last RMP's office - a small concrete room back in the outskirts of town. While the interview was conducted by Ashotosh, I sat with Clara and Ishani to discuss our impressions of the day and talk about upcoming plans. Over the course of the two days, we interviewed seven doctors and seven RMPs, well above the target of eight total. More importantly, we gained a lot of information that allowed us to revise the questionnaire to make it more concise, with more "closed-ended" questions (where the interviewer had multiple choices to check off instead of having to write answers out by hand). This should allow for a faster interview, less intrusive of the practitioners' time. 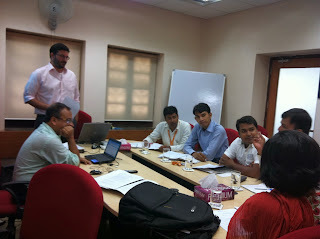 Next week, the interviewers will start the full fielding of the revised questionnaire; Ajeet, Ashotosh, Deepak and Vikash will, each target twelve RMPs, six qualified western-medicine doctors, and two AYUSH doctors - practitioners of one of the five disciplines of Ayurveda, Yoga, Unani, Siddha, and Homeopathy, for which there are accredited medical degrees in India. It will take them about a week to complete the interviews, and then the questionnaires will be turned over to our colleague Indrajit's team for coding and data analysis. After this, we should have some interesting results to pore over and to build into a presentation to share with the team!